"Hello and Welcome to my website! Let me tell you more about me..."
As soon as I entered this big wide world, I developed the taste to entertain! As long as I had an audience in front of me, I felt at home. From an early age, my two sisters and I, toured variety shows to elderly people in the local community. If I wasn’t doing that, I was performing my own one-man show for our family in the back garden. I have a versatile career, not only as a television presenter, but also as an actor, producer, and entertainer; from spending six months as a Butlins Redcoat for the Grand Hotel in Scarborough (where I learnt all the tricks of the trade), to playing in children’s shows for the Rank Organisation. To add to this, playing Benny in the West End production of “Singalongabba” (Whitehall Theatre) consisted of wearing a false beard, putting on a silly Swedish accent and miming whilst playing the piano – an achievement I felt was a big plus to my CV! 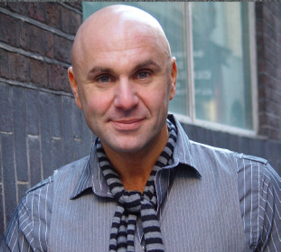 I am no stranger to the world of pantomime, with over twenty years’ experience behind me, some of my favourite experiences to date include playing Dame, opposite Gladiator Wolf for two years in ‘Snow White and the Seven Dwarfs’ and Smee in ‘Peter Pan’ opposite his great pal the late avenger Gareth Hunt. (Victoria Theatre, Halifax, the Pavilion Theatre, Worthing and The Stag Theatre, Sevenoaks). In 2008 I played the ugly sister Jordan in the very adult version of Cinderella/Sinderfella in the heart of London’s, Leicester Square Theatre in the famous West End. After which I spent a year touring Europe with the European Tour of ‘The Best of Broadway’ as compere and vocalist. My many television credits include: – ‘On the Road with Maureen Rees’ for the BBC in 1997. In 1998, I had the privilege to set up Laurence Llewyn Bowen on a ‘Gotcha!’ for Noel’s House Party (also for the BBC). In 2004 I was asked to be the Second Butler in Channel 4′s ‘What the Butler Saw’ – a six-part documentary on aristocracy. This saw, not only being part of a secret panel but also the start of a unique, off-the-cuff personality, bringing the screen to life. Following this was an invitation that I could not refuse; the opportunity to become ‘Britain’s best cook’ – which actually turned out to be Britain’s worst cook on ‘Hell’s Kitchen’ (ITV1). In those two weeks, I learnt what the difference was between an egg yolk and an egg white, along with another great achievement: learning to distinguish between a spatula and a whisk! I had the chance to entertain the nation with my totally unique and of the cuff personality, overall an experience I will never forget. All in all, I have forty six years of a varied and colourful career to date!